Beginning on May 18, 2018, general and mechanical contractors in South Carolina have been allowed to post a surety bond when applying for a license in the state. This change was implemented by House Bill 4612 which specifies the conditions under which such contractors can get bonded. Now, in order to get licensed, such contractors can post a South Carolina contractor license bond, instead of meeting the previously required minimum net worth requirement. This change significantly eases regulations for contractors and reduces hurdles on the way to getting a contractor license. Read on for an overview of the bill’s provisions! 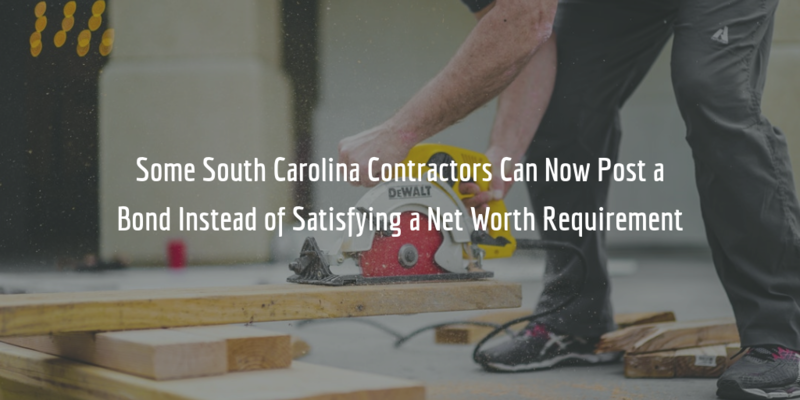 Before HB4612 was passed, general and mechanical contractors in South Carolina had to comply with a minimum net worth financial requirement in order to get licensed. Previously, under section 40-11-260 of the South Carolina Code of Laws, these contractors were classified each in five different license groups. These groups determined maximum amounts of bids and jobs that contractors having such a license could perform on. Each respective group also had minimum net worth requirements, ranging between $10,000 and $250,000 for general contractors, and $3,500 and $200,000 for mechanical contractors. In other words, under the SC Code, general contractors in license group 2 have been required to show a minimum net worth of $40,000. Applicants for this license group can now provide an $80,000 contractor license bond instead. If you are new to surety bonds, the bond amount may seem alarming. Yet, in fact, the change introduced by the bill actually eases financial requirements for contractors. See the next section for an explanation of the difference between bond amount and bond cost, and how the latter is determined. The amount of a surety bond, also known as its penal sum, is the maximum amount of compensation that a surety may extend if one or several claims are made against the bond. This amount is determined on a state level by legislators, and businesses and individuals that are required to obtain a bond must comply with the amount requirement when applying for the bond. This is not the same as the bond cost. The bond cost is determined by the surety individually for every applicant. In determining the bond rate, the surety places the greatest emphasis on an applicant’s credit score. It also considers other factors, such as personal and business financial statements, and may request cash verification or even look at an applicant’s resume. Typically, the higher an applicant’s credit score is – the lower their bond rate will be. For example, an applicant with a FICO credit score of 700 may be able to get bonded at a rate between .75%-1.5% of their total required bond amount. If you need to get a $20,000 bond and are asked to pay a 1% rate on your bond, then your bond cost will be $200. To find out how much exactly your bond may cost, complete our bond application form and we will provide you with a free and exact quote! Ready to apply for your contractor bond? Start with a FREE quote!